5wire Networks Review 2019: Is 5wire Networks a Good Hosting? 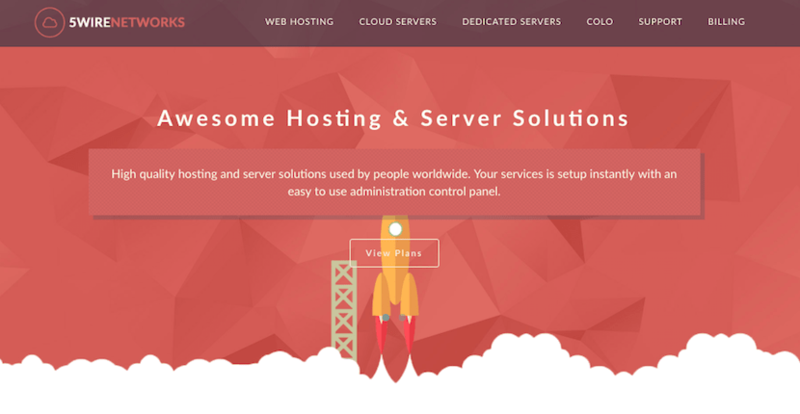 A London-based provider bringing enterprise level hosting to everyday website owners. They use multiple Tier III data centers in London and they commit to an uptime of 99.9%. Founded in 2008, 5wire Networks is a new company in the website hosting world. They are based in central London, however, they have customers around the world. They use two separate Tier III data centers in London. Their website and support are available in English. 5wire Networks focuses on providing enterprise-level service to everyday customers. Their services include shared hosting, dedicated servers, cloud hosting, and colocation. For new website owners, they offer a one-click installer for over 350 programs, which is quite a lot more than most companies offer. However, surprisingly, they don’t offer a website building tool. Also, for more advanced users, the lack of support for advanced scripting languages, as well as support for PHP 5.5, instead of far faster PHP 7.2 offered by other companies, may be a turn off. In terms of their packages, they do offer “unlimited” bandwidth. They address it in their frequently asked sections and state that their bandwidth is truly unlimited, however, only suitable for personal and small businesses. Furthermore, if you exceed normal usage, you will be asked to upgrade. Whilst I appreciate their transparency, this does not appear to be truly unlimited, and is more of a common marketing strategy used by website hosting providers. They are clearly providing top quality hardware to everyday users. Their servers are located in two separate Tier III data centers, which means their servers are dual-powered and redundant, and will have a maximum of 1.6 hours of downtime each year. They also use solid state disks (SSD) for faster speed and delivery, and 1Gbps Network Port for fast network connectivity. While their packages are great for new and small website owners, they do also offer dedicated hosting, colocation, and virtual cloud servers for when your business is ready to scale up. That said, their shared hosting packages are geared more towards smaller website owners due to the lack of support for advanced scripting languages. In terms of pricing, if you can work within the base package which includes 2GB disk space, unlimited bandwidth, and five domains, the price is very affordable. However, if you’re a larger business and require more disk space or domains, the higher two packages are relatively expensive when compared to both local and international competitors. The packages are pretty simple and straightforward. You can purchase monthly or annually, with a discount applied for a year paid upfront. They also offer a seven-day money-back guarantee, however, no free trial or free plan. You are able to upgrade at anytime, though, it is unclear what happens if you need to downgrade. Their customer service includes telephone, email, and Twitter. Telephone support is only available from 9 a.m. to 5 p.m., however they do have 24/7 technical support available via ticket. They have a substantial knowledge base available on their website as well as a network status page. I’ve contacted them several times via their Facebook page during daytime hours and they have always replied quickly. The customer service person was very friendly and well-informed about their service. 5wire Networks uses two Tier III data centers in London, however, they also have servers collocated in Tier I data centers around the world. Their aim is to provide enterprise-level hosting to all website owners. Wondering how 5wire Networks stacks up against other Web Hosting companies? Enter any other Web Hosting company and we will give you a side-by-side comparison.